The Bronze Goddess is my friend Mike Jacobs favorite smallmouth bass streamer. Mike created the Goddess several years ago to mimic reddish brown leaches and crayfish that are found in Northeast Iowa streams. 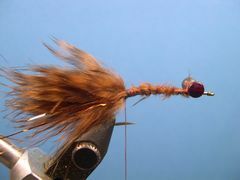 Join Mike as he shows you how to tie the Bronze Goddess. Size small lead dumbell eyes painted with burgundy fingernail enamel. 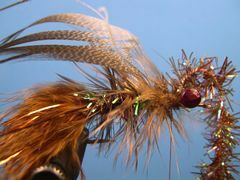 Brown Grizzly marabou with Copper Flashabou. Grizzly dyed brown rooster body feather. For details on how to fish the Bronze Goddess and tips for tying it click on this link to read Mike's article in Fly Tyer Magazine. Clamp the hook in the vise. Even though the photo doesn't show it, lay down a thread base from the hook eye back to the hook bend. Spiral the thread back up the shank to the front of the hook and tie in the lead dumbell eyes slightly behind the hook eye with several figure-eight wraps. 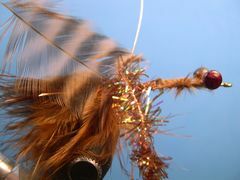 With the thread hanging directly behind the lead eyes, attach the marabou tail followed by a few strands of Copper Flashabou to the rear of the hook. 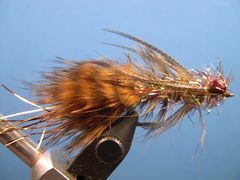 The marabou tail should be about one and a quarter times the length of the hook shank. 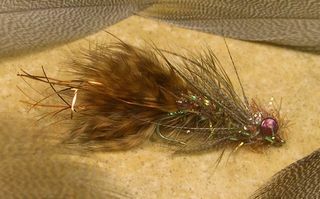 Leave the Flashabou strands about one-quarter inch longer the the marabou part of the tail. 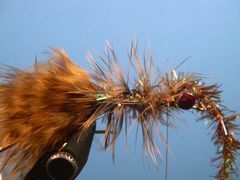 Tie in the Root Beer pearl crystal chenille, the Brown Grizzly body feather and the copper wire in that order at the base of the marabou tail. Note: the Grizzly body feather should be tied in by the feather tip. First, wrap the crystal chenille forward to the lead dumbell eyes and tie it down with a couple thread wraps. Don't remove the excess chenille. Be sure that enough chenille remains because you will use it later in Step 6 to form the head of the Goddess. Next, spiral wrap the the body feather forward to the lead eyes, tie it down with a couple of wraps, and clip the excess feather. Now, counter wrap the copper wire forward to the lead eyes, tie it down and clip any excess wire. Now it's time to use the Bronze Mallard feather which is the most important component of the Bronze Goddess. With the tying thread hanging directly behind the lead eyes, tie in the feather by its tip with the concave side of the feather facing the hook shank. You will notice that some bronze mallard feathers are "rights" and some are "lefts". This just indicates that the nice bronze colored fibers are situated along either the right side of the left side of the feather stem. I have found that it is easiest to get the feathers to cooperate if you wrap the "rights" in a clockwise direction around the hook and wrap the "lefts" in a counterclockwise direction. To finish off the Goddess take two turns of the Bronze Mallard feather behind the hook eyes. Tie off the feather with a couple of thread wraps and remove any excess feather. Next, move the thread to the front of the eyes, figure-eight the remaining Root Beer crystal chenille around the lead eyes and tie off the chenille with a couple of half-hitches. 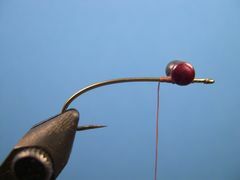 Finally, form a neat thread head and complete the fly with a couple of half-hitches or a whip-finish. Coat the thread head with cement and your Bronze Goddess is ready to fish.